286 pages | 7 B/W Illus. 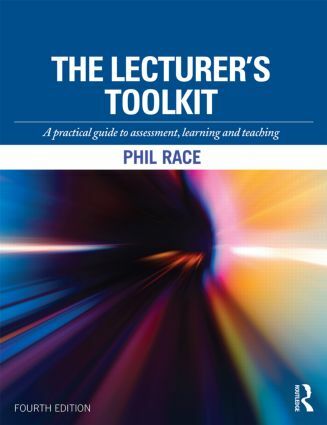 The Lecturer’s Toolkit is a wide-ranging, down-to-earth, practical resource for lecturers and teachers in universities and colleges. Jargon-free and written with authority, clarity and candour, the Toolkit addresses a broad range of aspects of assessment, feedback, learning and teaching, and helps develop many facets of professional practice. Fully updated and expanded, this fourth edition of the Toolkit will be an essential and flexible resource for every higher education professional. Phil Race is a Visiting Professor at Plymouth University and at University Campus, Suffolk, and Emeritus Professor of Leeds Metropolitan University. He is a Principal Fellow of the Higher Education Academy, and a National Teaching Fellow. He continues to travel widely in the UK and abroad giving conference keynotes and running staff development workshops in universities and colleges. His other publications include Making Learning Happen (2014) and How to Get a Good Degree (2007). For further information, visit www.phil-race.co.uk.